This find is sure to be the envy of all dinner tables; we could not help but to do a double take when we saw it. Obviously it was the hypnotic gleam of the gold leafing that initially drew us in, but this piece has so much more to offer then that. The base is a cast of an Acacia tree’s base and roots. Ohhh, how glorious Mother Nature is! The organic motion of the base almost gives you the impression that it’s a modern art sculpture. 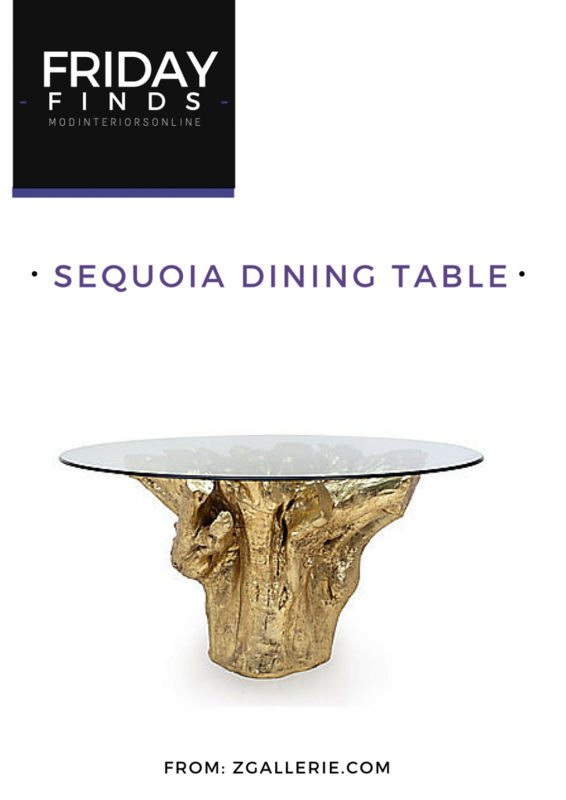 The Sequoia from ZGallerie can come with or without a 60″ glass top. Honestly, if you are not using a glassed top….. WHAT IS WRONG WITH YOU!?! The best feature of this table is its beauty from all angles, but most importantly through the top. There is no doubt, this table will glam up any space! We’d love to know what you think about this week’s Funky Find? Please fill us in by commenting below. Follow MOD INTERIORS on Pinterest and Facebook.